Scarlet macaws (Ara macao) are intensely colorful parrots that are plentiful all throughout their home base, which includes both Central and South America, from Nicaragua and Guatemala to Venezuela and Brazil. Many scarlet macaws fly freely in their natural habitats, but many are kept as household birds, too. These brilliantly conspicuous birds, as their names indicate, are crimson in color -- specifically on their shoulders and heads. Apart from red, scarlet macaws also display a variety of other colors, including blue on their tails, yellow on their backs and white on their faces. Their limbs are black. Body length is typically just over 35 inches. Scarlet macaws generally tip the scales at just over 42 ounces. Natural habitat-wise, these parrots are usually found in wet evergreen forests, up amidst the foliage of the trees. They are highly social and usually are seen in sizable units with other individuals. When kept as pets, they require a lot of attention from their caretakers. Scarlet macaws are generally considered to have sweet and friendly temperaments. If you have a scarlet macaw as a pet, it is crucial to make sure he always eats a diet that is catered exclusively to his species' needs. Scarlet macaws require basic dietary elements such as commercial macaw pellets, whole grains and fresh produce. As "once in a while" treats, nuts are acceptable in tiny amounts. Before offering your pet pellets, speak to a veterinarian to ensure that the formula is indeed suitable for scarlet macaws. After all, pellets are the bulk of his diet. Some fresh veggies and fruits that are safe for these birds include carrots, apples, pears and broccoli. 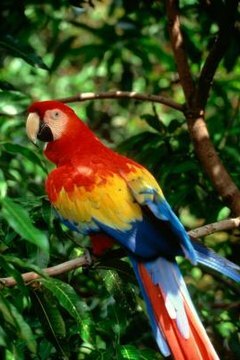 Only offer your scarlet macaw foods that a veterinarian has confirmed as safe. Scarlet macaws out in their natural roaming range feed heavily on nuts, stems, fruit, flowers, bugs, nectar, snails, seeds and foliage. Snails and bugs are beneficial for the macaw's protein content. Their pointy and angular bills make deconstructing tough seeds a rather easy job. They tend to gravitate toward fruit that is not yet mellow. Since these kinds of fruits have harder textures, they are difficult to eat for many other creatures -- but not for scarlet macaws, thanks to their big bills. Scarlet macaws focus on these fruits as a means of eliminating feeding competition. Wild scarlet macaws also, strangely enough, feed on a lot of clay, which they retrieve in riverbanks. By doing this, they gain the ability to consume poisonous and unripe foods that other species can't. When scarlet macaws eat fruit that isn't ripe, they often take in chemicals. Clay, however, is believed to counteract these dangers.